Rizzoli markerset protocols are available in Motive for human motion tracking. The Rizzoli protocols are developed and researched from the Movement Analysis Laboratory in the Rizzoli Orthopedics Institute, Italy. In biomechanics tracking applications, proper marker placements are critical to the human motion tracking and the respective biomechanical analysis; and for this reason, precise identification of the anatomical landmarks and marker placements have to be performed. In Motive:Body, marker locations are indicated over the avatar displayed in the Skeleton Pane. This page provides additional details on the anatomical locations of the marker placements for the Rizzoli protocols. The Rizzoli Lower Body protocol (26) integrates a novel marker placement for lower body tracking. This markerset is designed to provide a complete description of 3D segment and joint motion for analyzing the pelvis and lower extremity kinematics. 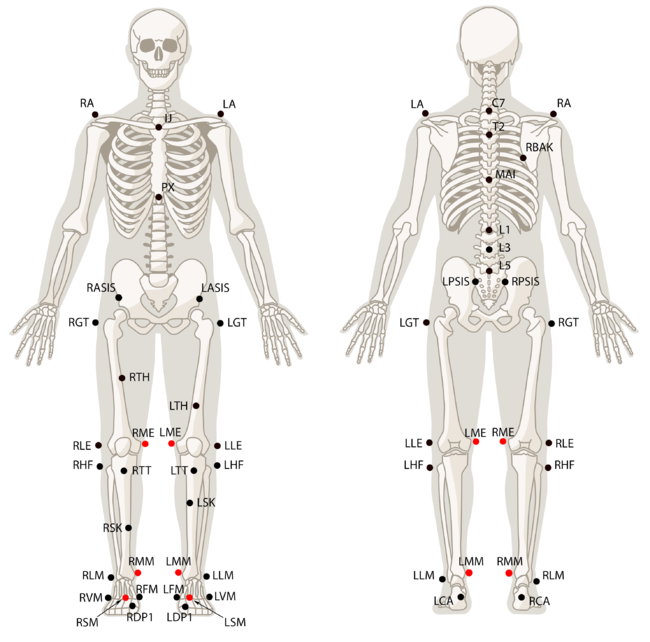 The following chart includes anatomical landmark descriptions of where the markers need to be placed for accurate and reliable analysis of the lower body movement. Includes total six calibration markers for creating the skeleton asset during static trials (RME/LME, RMM/LMM, RSM/LSM). They are highlighted in red. 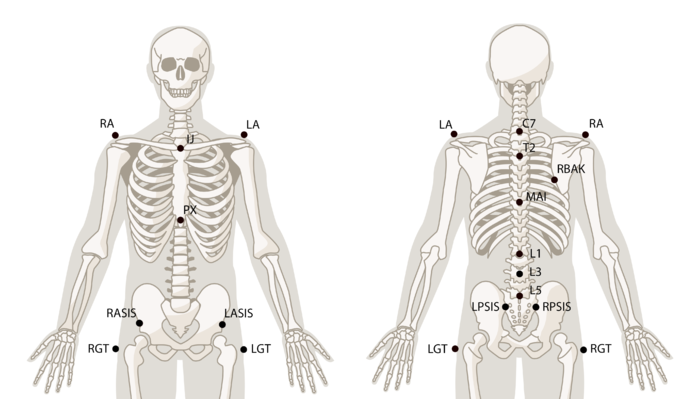 Two thigh markers (RTH and LTH) and two shank markers (RSK and LSK) have been added to the protocol to better distinguish the left and right of the skeleton. For more information on the segment and joint definitions, please refer to the referenced research papers. RASIS Pelvis Anterior superior iliac spine. RPSIS Pelvis Posterior superior iliac spine. RGT Upper Leg Most lateral prominence of the greater trochanter external surface. RTH Upper Leg Place near the midline of the thigh. Used only for a tracking purpose of distinguishing left and right side. For best result, offset the height of the marker between left and right side. RLE Upper Leg Most lateral prominence of the lateral femoral epicondyle. 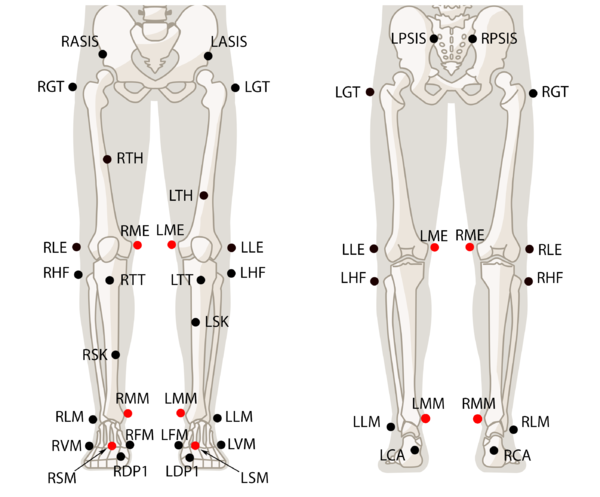 Together with LM markers, it determines the location of knee joint axis. RHF Lower Leg Head, proximal end, of the fibula. RTT Lower Leg Most anterior border of the tibial tuberosity. RSK Upper Leg Place near the midline of the shin. Used only for a tracking purpose of distinguishing left and right side. For best result, offset the height of the marker between left and right side. RLM Lower Leg Distal apex of the lateral malleolus. RCA Foot Upper ridge of the calcaneus posterior surface. The aspect of the Achilles tendon insertion on the calcaneus. RVM Foot Dorsal aspect of fifth metatarsal head. RFM Foot Dorsal aspect of first metatarsal head. RDP1 Foot These markers are added on the distal phalanx only for the toe segment tracking purpose, and they are not included in the biomechanical analysis. Place the marker near the end of the big toe. More specifically, the marker should be placed at the distal end of the first phalanges. RME* Upper Leg Medial prominence of the medial femoral epicondyle. RMM* Lower Leg Distal apex of the medial malleolus. RSM* Foot Dorsal aspect of second metatarsal head. *Highlighted in red are the calibration markers. They need to be removed after the skeleton has been created in Motive. This markerset is designed for tracking multi-segment trunk kinematics. Total 10 markers are place on the torso and 4 markers are placed around pelvis, and an extra back marker (RBAK) was added on the right scapula solely for improved tracking. Total four markers were placed around the waist for tracking the pelvis segment, and the orientation of the pelvis segment (Pel) is defined by these markers. 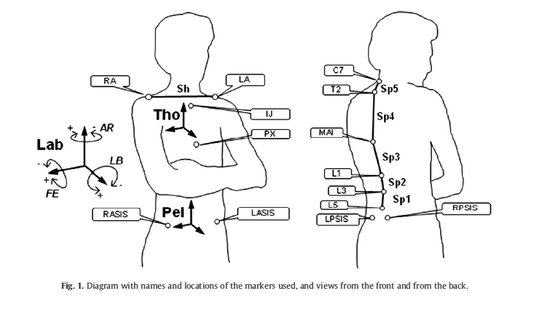 Total four markers are used for tracking the thorax segment, where two acromion markers (RA and LA) make the shoulder line segment for tracking the segment rotation and translations. For the spine motion tracking, a 5-link segment model is created from the six spine markers. An extra RBAK marker was added to the protocol for improved identification of left and right side of the tracked skeleton. For more information on the Rizzoli Trunk markerset, please refer to the referenced research papers. RBAK Torso Placed near the right scapula apex: Used only to Identify left and right of the skeleton. C7 Torso Seventh cervical vertebrae. MAI Torso Midpoint between left and right scapular apex, near the T10 vertebrae. IJ Torso Jugular Notch. Most superior region of the sternum, where it meets the clavicle bones. PX Torso Xiphoid process of the sternum. Most inferior region of the sternum. L1 Torso First lumbar vertebrae. L3 Torso Third lumbar vertebrae. L5 Torso First lumbar vertebrae. The Rizzoli Body Protocol (37) combines the Rizzoli Lower Body Protocol and the Rizzoli Trunk Protocol to provide tracking of the full body kinematics. RBAK Torso Placed near the right scapula apex: Used only for identifying left and right of the skeleton. RSK Upper Leg Place near the midline of the shin. Used only for a tracking purpose of distinguishing left and right side For best result, offset the height of the marker between left and right side. 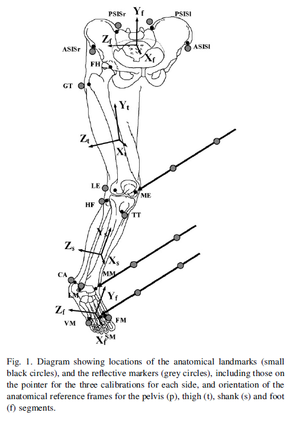 The Rizzoli Left/Right Foot Protocols (14) provide precise tracking of the foot kinematics by modeling three-foot segments – rear-foot, mid-foot, and fore-foot – from the markers that are placed on carefully identified anatomical landmarks of the foot . The following diagrams and the chart detail on where each marker needs to be placed on the right foot protocol. The placements for the left foot will be anatomically equivalent but reflected. There are two calibration markers in each foot protocol. They are located at the apex of the medial malleolus (RMM/LMM) and the lowest point of the heel center (RCAp/LCAp). These markers are only for creating the asset for static trials, and they need to be removed for dynamic trials. Refer to the referenced papers for specific information on the joint and segment definitions. RPM/LPM Most distal and dorsal point of the head of the proximal phalanx of the hallux. RFMH/LFMH Head of the first metatarsal, dorso-medial aspect of the first metatarso-phalangeal joint. 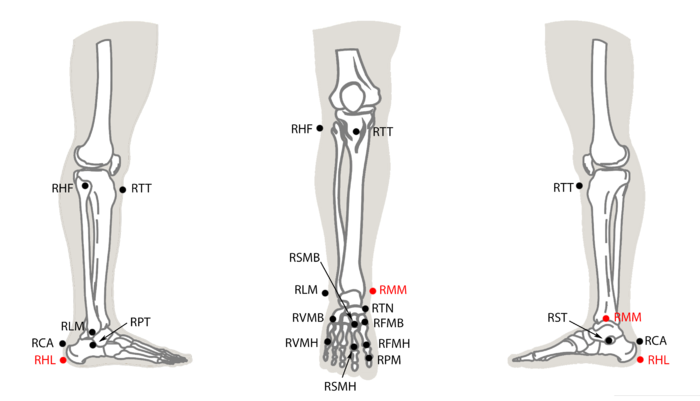 RSMH/RSMH Head of the second metatarsal, dorso-medial aspect of the second metatarso-phalangeal joint. RVMH/LVMH Head of the fifth metatarsal, dorso-lateral aspect of the fifth metatarso-phalangeal joint. 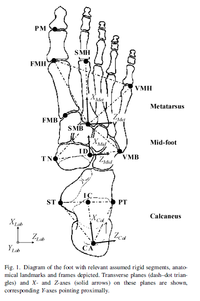 RFMB/LFMB Base of the first metatarsal, dorso-medial aspect of the first metatarso-cuneiform joint. RSMB/LSMB Base of the second metatarsal, dorso-medial aspect of the first metatarso-cuneiform joint. RVMB/LVMB Base of the first metatarsal, dorso-medial aspect of the first metatarso-cuboid joint. RTN/LTN Most medial apex of the tuberosity of the navicular. RST/LST Lateral apex of the sustentaculum tali. RPT/LPT Lateral apex of the peroneal tubercle. RCA/LCA Upper central ridge of the calcaneus posterior surface, i.e. Achilles's tendon attachment. RLM/LLM Distal apex of the lateral malleolus. RHF/LHF Most proximal apex of the head of the fibula. RTT/LTT Most anterior prominence of the tibial tuberosity. RMM/LMM* Distal apex of the medial malleolus. RHL/LHL* (RCAp/LCAp) Projection of the CA marker on the ground. Vertically aligned with the CA marker and placed near the ground level. This is a calibration marker that needs to be removed for dynamic trials. ↑ 1.00 1.01 1.02 1.03 1.04 1.05 1.06 1.07 1.08 1.09 1.10 1.11 1.12 1.13 1.14 1.15 1.16 1.17 1.18 1.19 1.20 1.21 1.22 1.23 1.24 1.25 1.26 1.27 1.28 1.29 1.30 1.31 1.32 1.33 1.34 1.35 1.36 1.37 1.38 1.39 1.40 1.41 1.42 1.43 1.44 1.45 1.46 1.47 1.48 1.49 1.50 1.51 1.52 1.53 1.54 1.55 1.56 1.57 1.58 1.59 1.60 1.61 1.62 1.63 1.64 1.65 1.66 1.67 1.68 1.69 1.70 Leardini, A., Sawacha, Z., Paolini, G., Ingrosso, S., Nativo, R., Benedetti, M.G., 2007. A new anatomically based protocol for gait analysis in children. Gait Posture 26. 560-571. ↑ 2.00 2.01 2.02 2.03 2.04 2.05 2.06 2.07 2.08 2.09 2.10 2.11 2.12 2.13 2.14 2.15 2.16 2.17 2.18 2.19 2.20 2.21 2.22 2.23 2.24 2.25 2.26 2.27 2.28 2.29 2.30 2.31 2.32 2.33 2.34 2.35 2.36 2.37 2.38 2.39 2.40 2.41 Leardini, A., Biagi, F., Merlo, A., Belvedere, C., Benedetti, M.G., 2011. Multi-segment trunk kinematics during locomotion and elementary exercises. Clin. Biomech. 26, 562-571. ↑ 3.00 3.01 3.02 3.03 3.04 3.05 3.06 3.07 3.08 3.09 3.10 3.11 3.12 3.13 3.14 3.15 3.16 3.17 3.18 3.19 3.20 3.21 3.22 3.23 3.24 3.25 3.26 3.27 3.28 3.29 3.30 3.31 3.32 3.33 3.34 3.35 3.36 3.37 3.38 3.39 3.40 3.41 3.42 3.43 3.44 3.45 3.46 3.47 3.48 3.49 3.50 Leardini, A., Benedetti, M.G., Berti, L., Bettinelli, D., Nativo, R., Giannini, S., 2007. Rear-foot, mid-foot and fore-foot motion during the stance phase of gait. Gait Posture 25. 453-462. ↑ 4.00 4.01 4.02 4.03 4.04 4.05 4.06 4.07 4.08 4.09 4.10 4.11 4.12 4.13 4.14 4.15 4.16 4.17 4.18 4.19 4.20 4.21 4.22 4.23 4.24 4.25 4.26 4.27 4.28 4.29 Portinaro, N., Leardini, A., Panou, A., Monzani, V., Caravaggi, P., 2014. Modifying the Rizzoli foot model to improve the diagnosis of pes-planus: application to kinematics of feet in teenagers. Journal of Foot and Ankle Research 7, 57. This page was last modified on 14 February 2018, at 17:21.